Shopping for kids’ clothes can be tough when they’re constantly growing out of them! This is one of the reasons why I don’t go overboard with spending money on adorable pieces of cloth that might only get worn a handful of times. So naturally, my search for online deals consist of 1.) free shipping 2.) clearance items, arranged “low to high” for price and 3.) coupon codes. That’s a simple recipe for gettin’ those clothes to your door, cheap. 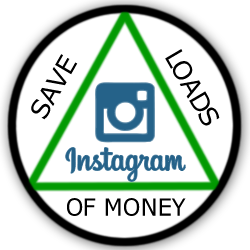 Couponaholic is going to condense those three steps into one step for ya, so let us do the homework and deliver parcels of saving tips to you everyday! 4/15 ONLY! Up to 50%+ OFF Dockers Clothing + MORE at Amazon! There is a hot Amazon “Deal of the Day” offer on Dockers clothing. Today 4/15 only, they are offering savings of up to 50%+ on select items. SEE ALL THE INCLUDED SALE ITEMS HERE! 4/15 ONLY! Up to 50%+ OFF Dockers Clothing + MORE at Amazon! Up to 50%+ OFF/Dockers @Amazon/APRIL 15TH ONLY! FIVE Pairs of Baby Leggings/Leg Warmers for only $2 plus shipping! 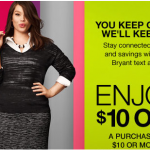 ANOTHER $10 off Lane Bryant in-store purchase text coupon = MORE FREEBIES! 3/24 ONLY! Up to 64% OFF Chico’s Women’s Apparel at Amazon! Amazon: $7 Hanes Men’s Ecosmart Fleece Sweatshirt w/sale! 2/24 ONLY! Up to 60% off Men’s & Women’s Activewear at Amazon! Here is another great Amazon deal for you. Today 2/24 ONLY, they are offering up to 60% off select men’s and women’s activewear. Check out all of the included items in today’s deal below. 2/24 ONLY! Up to 60% off Men’s & Women’s Activewear at Amazon!